The film begins with Gandhi's assassination on 30 January 1948, and his funeral. After an evening prayer, an elderly Gandhi is helped out for his evening walk to meet a large number of greeters and admirers. One of these visitors - Nathuram Godse - shoots him point blank in the chest. Gandhi exclaims, "Oh, God!" ("Hē Ram!" historically), and then falls dead. The film then cuts to a huge procession at his funeral, which is attended by dignitaries from around the world. 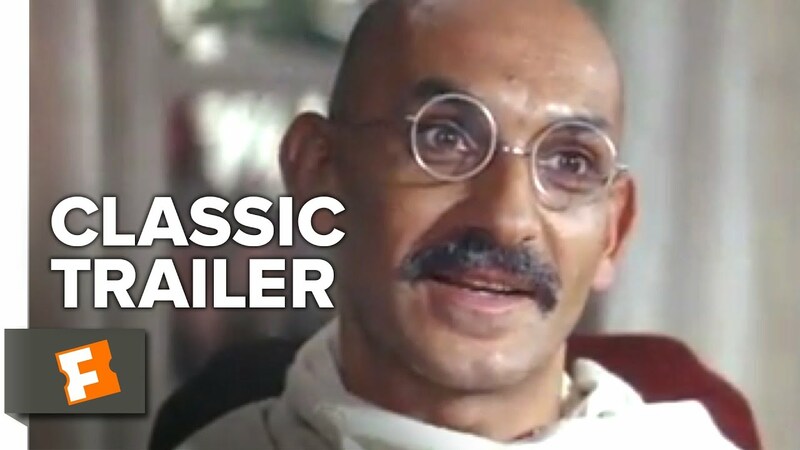 The early life of Gandhi is not depicted in the film. Instead, the story flashes back 55 years to a life-changing event: in 1893, the 24-year-old Gandhi is thrown off a South African train for being an Indian sitting in a first-class compartment despite having a ticket. Realizing the laws are biased against Indians, he then decides to start a non-violent protest campaign for the rights of all Indians in South Africa. After numerous arrests and unwelcome international attention, the government finally relents by recognizing some rights for Indians. After this victory, Gandhi is invited back to India, where he is now considered something of a national hero. He is urged to take up the fight for India's independence (Swaraj, Quit India) from the British Empire. Gandhi agrees, and mounts a non-violent non-cooperation campaign of unprecedented scale, coordinating millions of Indians nationwide. There are some setbacks, such as violence against the protesters and Gandhi's occasional imprisonment. Nevertheless, the campaign generates great attention, and Britain faces intense public pressure. After World War II Britain finally grants Indian independence. Indians celebrate this victory, but their troubles are far from over. Religious tensions between Hindus and Muslims erupt into nation-wide violence. Gandhi declares a hunger strike, saying he will not eat until the fighting stops. The fighting does stop eventually, but the country is divided by religion. It is decided that the northwest area of India, and eastern part of India (current day Bangladesh), both places where Muslims are in the majority, will become a new country called Pakistan. It is hoped that by encouraging the Muslims to live in a separate country, violence will abate. Gandhi is opposed to the idea, and is even willing to allow Muhammad Ali Jinnah to become the first prime minister of India, but the Partition of India is carried out nevertheless. Gandhi spends his last days trying to bring about peace between both nations. He thereby angers many dissidents on both sides, one of whom assassinates him in a scene at the end of the film that recalls the opening. 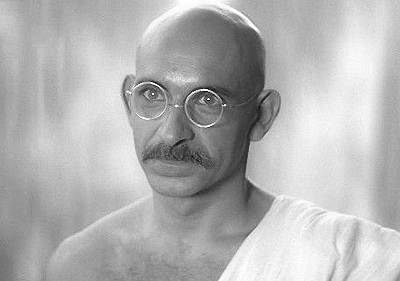 Gandhi is a 1982 biographical film based on the life of Mohandas Karamchand Gandhi, who led the nonviolent resistance movement against British colonial rule in India during the first half of the 20th century. 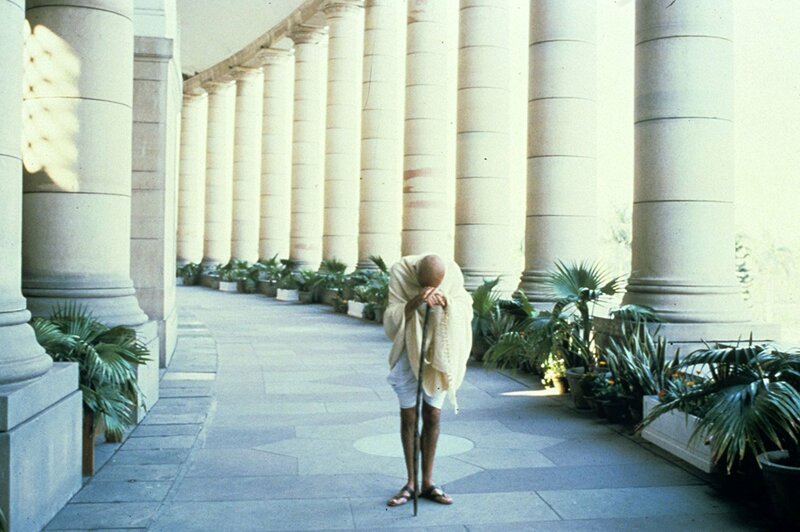 The film was directed and produced by Sir Richard Attenborough and stars Ben Kingsley as Gandhi. They both won Academy Awards for their work on the film. The film was also given the Academy Award for Best Picture and won eight Academy Awards. It was an international co-production between production companies in India and the UK. The film premiered in New Delhi on 30 November 1982.